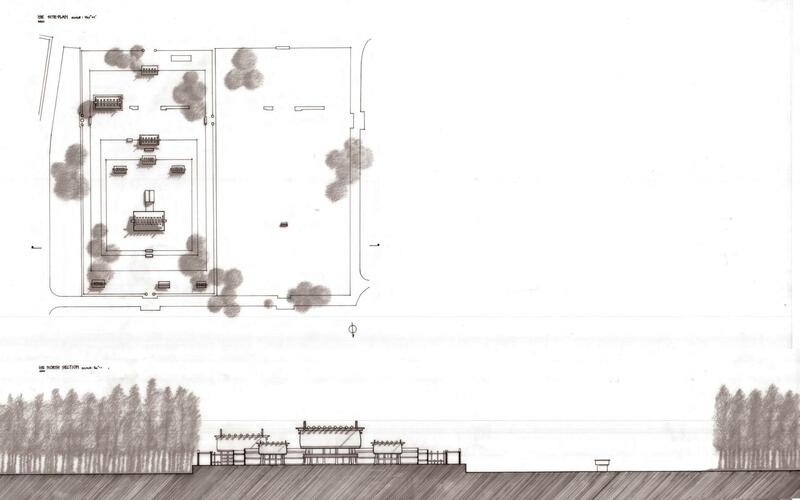 In third year of arch school I drew the Ise Shinto Shrines in Ise, Japan for an investigative study. I kept trying to capture the form and compose the drawing just-so, but it took a while…to understand the faith, and then delineate it honestly, was a very enjoyable challenge. wabi-sabi in Japanese translates into imperamanence…the transient, cyclical order of life death and rebirth/renewal in nature. They disassemble the whole temple complex every 20 years and rebuild an exact replica of it on the adjacent plot of land so that the shrines are neither new nor old. I guess that makes them timeless. The drawing is pen on vellum with an underlay of graphite shadows…and the composition portrays the order inherent in the subject at hand…tracing footsteps of the solid-void relationship these spatial carvings leave in the forests of Ise. This year, I hope to see these shrines in person….to smell and touch the forest, and relish the carpentry- the ancient, immaculate, economy of this wood craft that has withstood everything from eroding belief systems to shattering earthquakes. October will bring Japanese adventures, stay tuned for pictures…more about that later!